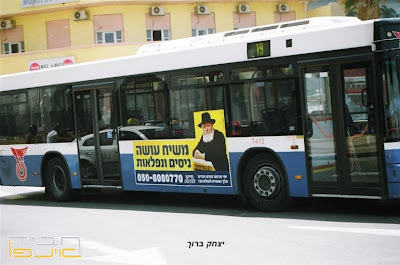 Recently signs were placed on Eged buses all over Eretz Yisroel (Land of Israel) with the words: Moshiach Oseh Nisim (Moshiach Makes Miracles) and a phone number which people can call to ask for Brachos (blessings from the Rebe King Moshiach) through the Igros Kodesh. Click Here: http://chabad.info/audio/shonot/MASHIACH%20-%20FINAL%20JINGEL.mp3 to play the song. "Charlie Buttons" in a tuxedo!